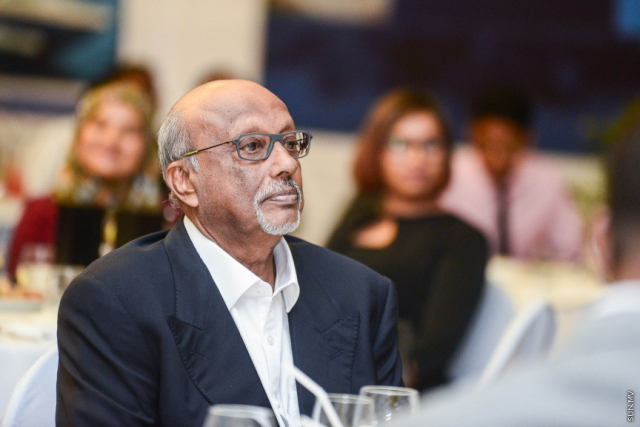 The Corporate Maldives Lifetime Achievement Award was the most prestigious award conferred at Corporate Maldives’ Gold 100 Gala on Thursday night. One of the two people to win the prestigious award is the former Vice President of Maldives, Al Nabeel Mohammed Waheed Deen. Owner of Bandos Maldives, ex-VP Deen has been working at the Maldivian travel and tourism industry since its inception. Deen, who started his career as a public relations officer charged with welcoming tourists to Maldives, has worked in almost all areas of resort operations. Deen was appointed General Manager of Bandos Island Resort – the second resort to open in Maldives in the 1970’s. He invested a lot of expertise and his private funds to Bandos, and later purchased the resort – making it the leading venue for corporate conferences and events it is today. Accepting the Lifetime Achievement Award at the Gold 100 Gala on Thursday night, he credited his success to all his former and current employees. Deen said he has always had deep respect for his employees. “I am here today because of the integrity and honesty of my employees. No doubt, I have always respected all employees who work for me – from the lowest ranking employees to highest ranking employees,” said Deen. In his speech, he shared his wisdom and advise with fellow business owners. “All you CEOs, question what your employees want, what their needs are,” said Deen. He said even the lowest-ranking employee may have something of value to share with the top management. “Never, even for one second, believe there’s no one who knows better than you, because of your status, or because God blessed you with wealth. All CEOs must listen to what even the lowest ranking employee has to say. It’s possible that he may have thought of something that you yourself have not,” said Deen. Waheed Deen is a top contributor to human resource in Maldives, both in travel and tourism and other fields. Deen, who served at Minister of Atolls, ran an educational institute – Institute of Governance and Development – which’s mission was to empower citizens in islands.